Not to be confused with Tennessean. "Uus" redirects here. For other uses, see UUS (disambiguation). "E117" redirects here. For the E-road, see European route E117. The discovery of tennessine was officially announced in Dubna, Russia, by a Russian–American collaboration in April 2010, which makes it the most recently discovered element as of 2019[update]. One of its daughter isotopes was created directly in 2011, partially confirming the results of the experiment. The experiment itself was repeated successfully by the same collaboration in 2012 and by a joint German–American team in May 2014. 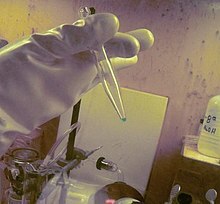 In December 2015, the Joint Working Party of the International Union of Pure and Applied Chemistry (IUPAC) and the International Union of Pure and Applied Physics, which evaluates claims of discovery of new elements, recognized the element and assigned the priority to the Russian–American team. In June 2016, the IUPAC published a declaration stating that the discoverers had suggested the name tennessine after Tennessee, United States. [a] In November 2016, they officially adopted the name "tennessine". Tennessine may be located in the "island of stability", a concept that explains why some superheavy elements are more stable compared to an overall trend of decreasing stability for elements beyond bismuth on the periodic table. The synthesized tennessine atoms have lasted tens and hundreds of milliseconds. In the periodic table, tennessine is expected to be a member of group 17, all other members of which are halogens. [b] Some of its properties may significantly differ from those of the halogens due to relativistic effects. As a result, tennessine is expected to be a volatile metal that neither forms anions nor achieves high oxidation states. A few key properties, such as its melting and boiling points and its first ionization energy, are nevertheless expected to follow the periodic trends of the halogens. In December 2004, the Joint Institute for Nuclear Research (JINR) team in Dubna, Moscow Oblast, Russia, proposed a joint experiment with the Oak Ridge National Laboratory (ORNL) in Oak Ridge, Tennessee, United States, to synthesize element 117—so-called for the 117 protons in its nucleus. Their proposal involved fusing a berkelium (element 97) target and a calcium (element 20) beam, conducted via bombardment of the berkelium target with calcium nuclei: this would complete a set of experiments done at the JINR on the fusion of actinide targets with a calcium-48 beam, which had thus far produced the new elements 113–116 and 118. The ORNL—then the world's only producer of berkelium—could not then provide the element, as they had temporarily ceased production, and re-initiating it would be too costly. Plans to synthesize element 117 were suspended in favor of the confirmation of element 118, which had been produced earlier in 2002 by bombarding a californium target with calcium. The required berkelium-249 is a by-product in californium-252 production, and obtaining the required amount of berkelium was an even more difficult task than obtaining that of californium, as well as costly: it would cost around 3.5 million dollars, and the parties agreed to wait for a commercial order of californium production, from which berkelium could be extracted. The JINR team sought to use berkelium because calcium-48, the isotope of calcium used in the beam, has 20 protons and 28 neutrons, making a neutron–proton ratio of 1.4; and it is the lightest stable or near-stable nucleus with such a large neutron excess. The second-lightest such nucleus, palladium-110 (46 protons, 64 neutrons, neutron–proton ratio of 1.391), is much heavier. Thanks to the neutron excess, the resulting nuclei were expected to be heavier and closer to the sought-after island of stability. [c] Of the aimed for 117 protons, calcium has 20, and thus they needed to use berkelium, which has 97 protons in its nucleus. In February 2005, the leader of the JINR team—Yuri Oganessian—presented a colloquium at ORNL. Also in attendance were representatives of Lawrence Livermore National Laboratory, who had previously worked with JINR on the discovery of elements 113–116 and 118, and Joseph Hamilton of Vanderbilt University, a collaborator of Oganessian. ORNL resumed californium production in spring 2008. Hamilton noted the restart during the summer and made a deal on subsequent extraction of berkelium. During a September 2008 symposium at Vanderbilt University in Nashville, Tennessee celebrating his 50th year on the Physics faculty, he introduced Oganessian to James Roberto (then the deputy director for science and technology at ORNL). They established a collaboration among JINR, ORNL, and Vanderbilt; the team at the Lawrence Livermore National Laboratory (LLNL) in Livermore, California, U.S., was soon invited to join. In November 2008, the U.S. Department of Energy, which had oversight over the reactor in Oak Ridge, allowed the scientific use of the extracted berkelium. The production lasted 250 days and ended in late December 2008, resulting in 22 milligrams of berkelium, enough to perform the experiment. In January 2009, the berkelium was removed from ORNL’s High Flux Isotope Reactor; it was subsequently cooled for 90 days and then processed at ORNL’s Radiochemical Engineering and Development Center to separate and purify the berkelium material, which took another 90 days. Its half-life is only 330 days: after that time, half the berkelium produced would have decayed. Because of this, the berkelium target had to be quickly transported to Russia; for the experiment to be viable, it had to be completed within six months of its departure from the United States. The target was packed into five lead containers to be flown from New York to Moscow. Russian customs officials twice refused to let the target enter the country because of missing or incomplete paperwork. Over the span of a few days, the target traveled over the Atlantic Ocean five times. On its arrival in Russia in June 2009, the berkelium was transferred to Research Institute of Atomic Reactors (RIAR) in Dimitrovgrad, Ulyanovsk Oblast, where it was deposited as a 300-nanometer-thin layer on a titanium film. In July 2009, it was then transported to Dubna, where it was installed in the particle accelerator at JINR. The calcium-48 beam was generated by chemically extracting the small quantities of calcium-48 present in naturally occurring calcium, enriching it 500 times. This work was done in the closed town of Lesnoy, Sverdlovsk Oblast, Russia. Decay chain of the atoms produced in the original experiment. The figures near the arrows describe experimental (black) and theoretical (blue) values for the half-life and energy of each decay. All daughter isotopes (decay products) of element 117 were previously unknown; therefore, their properties could not be used to confirm the claim of discovery. In 2011, when one of the decay products (289115) was synthesized directly, its properties matched those measured in the claimed indirect synthesis from the decay of element 117. The discoverers did not submit a claim for their findings in 2007–2011 when the Joint Working Party was reviewing claims of discoveries of new elements. The Dubna team repeated the experiment in 2012, creating seven atoms of element 117 and confirming their earlier synthesis of element 118 (produced after some time when a significant quantity of the berkelium-249 target had beta decayed to californium-249). The results of the experiment matched the previous outcome; the scientists then filed an application to register the element. In May 2014, a joint German–American collaboration of scientists from the ORNL and the GSI Helmholtz Center for Heavy Ion Research in Darmstadt, Hessen, Germany, claimed to have confirmed discovery of the element. The team repeated the Dubna experiment using the Darmstadt accelerator, creating two atoms of element 117. In May 2016, Lund University (Lund, Scania, Sweden) and GSI cast some doubt on the syntheses of elements 115 and 117. The decay chains assigned to 289115, the isotope instrumental in the confirmation of the syntheses of elements 115 and 117, were found to be too different to belong to the same nuclide with a reasonably high probability. The reported 293117 decay chains approved as such by the JWP were found to require splitting into individual data sets assigned to different isotopes of element 117. It was also found that the claimed link between the decay chains reported as from 293117 and 289115 probably did not exist. (On the other hand, the chains from the non-approved isotope 294117 were found to be congruent.) The multiplicity of states found when nuclides that are not even–even undergo alpha decay is not unexpected and contributes to the lack of clarity in the cross-reactions. This study criticized the JWP report for overlooking subtleties associated with this issue, and noted that the fact that the only argument for the acceptance of the discoveries of elements 115 and 117 was an almost certainly non-existent link was "problematic". On June 8, 2017, two members of the Dubna team published a journal article answering these criticisms, analysing their data on the nuclides 293117 and 289115 with widely accepted statistical methods, noted that the 2016 studies indicating non-congruence produced problematic results when applied to radioactive decay: they excluded from the 90% confidence interval both average and extreme decay times, and the decay chains that would be excluded from the 90% confidence interval they chose were more probable to be observed than those that would be included. The 2017 reanalysis concluded that the observed decay chains of 293117 and 289115 were consistent with the assumption that only one nuclide was present at each step of the chain, although it would be desirable to be able to directly measure the mass number of the originating nucleus of each chain as well as the excitation function of the 243Am+48Ca reaction. Using Mendeleev's nomenclature for unnamed and undiscovered elements, element 117 should be known as eka-astatine. Using the 1979 recommendations by the International Union of Pure and Applied Chemistry (IUPAC), the element was temporarily called ununseptium (symbol Uus) until its discovery was confirmed and a permanent name chosen; the temporary name was formed from Latin roots "one", "one", and "seven", a reference to the element's atomic number of 117. Many scientists in the field called it "element 117", with the symbol E117, (117), or 117. According to guidelines of IUPAC valid at the moment of the discovery approval, the permanent names of new elements should have ended in "-ium"; this included element 117, even if the element was a halogen, which traditionally have names ending in "-ine"; however, the new recommendations published in 2016 recommended using the "-ine" ending for all new group 17 elements. The IUPAC guidelines specify that the discovery team has naming rights for the element. In March 2016, the discovery team agreed on a conference call involving representatives from the parties involved on the name "tennessine" for element 117. In June 2016, IUPAC published a declaration stating the discoverers had submitted their suggestions for naming the new elements 115, 117, and 118 to the IUPAC; the suggestion for the element 117 was tennessine, with a symbol of Ts, after "the region of Tennessee". [a] The suggested names were recommended for acceptance by the IUPAC Inorganic Chemistry Division; formal acceptance was set to occur after a five-months term following publishing of the declaration expires. In November 2016, the names, including tennessine, were formally accepted. Concerns that the proposed symbol Ts may clash with a notation for the tosyl group used in organic chemistry were rejected, following existing symbols bearing such dual meanings: Ac (actinium and acetyl) and Pr (praseodymium and propyl). The naming ceremony for moscovium, tennessine, and oganesson was held in March 2017 at the Russian Academy of Sciences in Moscow; a separate ceremony for tennessine alone had been held at ORNL in January 2017. The stability of nuclei quickly decreases with the increase in atomic number after curium, element 96, whose half-life is four orders of magnitude longer than that of any subsequent element. All isotopes with an atomic number above 101 undergo radioactive decay with half-lives of less than 30 hours. No elements with atomic numbers above 82 (after lead) have stable isotopes. This is because of the ever-increasing Coulomb repulsion of protons, so that the strong nuclear force cannot hold the nucleus together against spontaneous fission for long. Calculations suggest that in the absence of other stabilizing factors, elements with more than 104 protons should not exist. However, researchers in the 1960s suggested that the closed nuclear shells around 114 protons and 184 neutrons should counteract this instability, creating an "island of stability" where nuclides could have half-lives reaching thousands or millions of years. While scientists have still not reached the island, the mere existence of the superheavy elements (including tennessine) confirms that this stabilizing effect is real, and in general the known superheavy nuclides become exponentially longer-lived as they approach the predicted location of the island. Tennessine is the second-heaviest element created so far, and all its known isotopes have half-lives of less than one second. Nevertheless, this is longer than the values predicted prior to their discovery. The Dubna team believes that the synthesis of the element is direct experimental proof of the existence of the island of stability. A chart of nuclide stability as used by the Dubna team in 2010. Characterized isotopes are shown with borders. According to the discoverers, the synthesis of element 117 serves as definite proof of the existence of the "island of stability" (circled). It has been calculated that the isotope 295Ts would have a half-life of about 18 milliseconds, and it may be possible to produce this isotope via the same berkelium–calcium reaction used in the discoveries of the known isotopes, 293Ts and 294Ts. The chance of this reaction producing 295Ts is estimated to be, at most, one-seventh the chance of producing 294Ts. Calculations using a quantum tunneling model predict the existence of several isotopes of tennessine up to 303Ts. The most stable of these is expected to be 296Ts with an alpha-decay half-life of 40 milliseconds. A liquid drop model study on the element's isotopes shows similar results; it suggests a general trend of increasing stability for isotopes heavier than 301Ts, with partial half-lives exceeding the age of the universe for the heaviest isotopes like 335Ts when beta decay is not considered. Lighter isotopes of tennessine may be produced in the 243Am+50Ti reaction, which was considered as a contingency plan by the Dubna team in 2008 if 249Bk proved unavailable, and may be studied again in the near future (2017–2018) to investigate the properties of nuclear reactions with a titanium-50 beam, which becomes necessary to synthesize elements beyond oganesson. Tennessine is expected to be a member of group 17 in the periodic table, below the five halogens; fluorine, chlorine, bromine, iodine, and astatine, each of which has seven valence electrons with a configuration of ns2np5. [e] For tennessine, being in the seventh period (row) of the periodic table, continuing the trend would predict a valence electron configuration of 7s27p5, and it would therefore be expected to behave similarly to the halogens in many respects that relate to this electronic state. However, going down group 17, the metallicity of the elements increases; for example, iodine already exhibits a metallic luster in the solid state, and astatine is often classified as a metalloid due to its properties being quite far from those of the four previous halogens. As such, an extrapolation based on periodic trends would predict tennessine to be a rather volatile post-transition metal. The melting and boiling points of tennessine are not known; earlier papers predicted about 350–500 °C and 550 °C, respectively, or 350–550 °C and 610 °C, respectively. These values exceed those of astatine and the lighter halogens, following periodic trends. A later paper predicts the boiling point of tennessine to be 345 °C (that of astatine is estimated as 309 °C, 337 °C, or 370 °C, although experimental values of 230 °C and 411 °C have been reported). The density of tennessine is expected to be between 7.1 and 7.3 g/cm3, continuing the trend of increasing density among the halogens; that of astatine is estimated to be between 6.2 and 6.5 g/cm3. 3 is predicted to have a trigonal configuration. The known isotopes of tennessine, 293Ts and 294Ts, are too short-lived to allow for chemical experimentation at present. Nevertheless, many chemical properties of tennessine have been calculated. Unlike the previous group 17 elements, tennessine may not exhibit the chemical behavior common to the halogens. For example, fluorine, chlorine, bromine, and iodine routinely accept an electron to achieve the more stable electronic configuration of a noble gas, obtaining eight electrons (octet) in their valence shells instead of seven. This ability weakens as atomic weight increases going down the group; tennessine would be the least willing group 17 element to accept an electron. Of the oxidation states it is predicted to form, −1 is expected to be the least common. The standard reduction potential of the Ts/Ts− couple is predicted to be −0.25 V; this value is negative and thus tennessine should not be reduced to the −1 oxidation state under standard conditions, unlike all the previous halogens. There is another opportunity for tennessine to complete its octet—by forming a covalent bond. Like the halogens, when two tennessine atoms meet they are expected to form a Ts–Ts bond to give a diatomic molecule. Such molecules are commonly bound via single sigma bonds between the atoms; these are different from pi bonds, which are divided into two parts, each shifted in a direction perpendicular to the line between the atoms, and opposite one another rather than being located directly between the atoms they bind. Sigma bonding has been calculated to show a great antibonding character in the At2 molecule and is not as favorable energetically. Tennessine is predicted to continue the trend; a strong pi character should be seen in the bonding of Ts2. The molecule tennessine chloride (TsCl) is predicted to go further, being bonded with a single pi bond. The simplest possible tennessine compound would be the monohydride, TsH. The bonding is expected to be provided by a 7p3/2 electron of tennessine and the 1s electron of hydrogen. The non-bonding nature of the 7p1/2 spinor is because tennessine is expected not to form purely sigma or pi bonds. Therefore, the destabilized (thus expanded) 7p3/2 spinor is responsible for bonding. This effect lengthens the TsH molecule by 17 picometers compared with the overall length of 195 pm. Since the tennessine p electron bonds are two-thirds sigma, the bond is only two-thirds as strong as it would be if tennessine featured no spin–orbit interactions. The molecule thus follows the trend for halogen hydrides, showing an increase in bond length and a decrease in dissociation energy compared to AtH. The molecules TlTs and NhTs may be viewed analogously, taking into account an opposite effect shown by the fact that the element's p1/2 electrons are stabilized. These two characteristics result in a relatively small dipole moment (product of difference between electric charges of atoms and displacement of the atoms) for TlTs; only 1.67 D,[g] the positive value implying that the negative charge is on the tennessine atom. For NhTs, the strength of the effects are predicted to cause a transfer of the electron from the tennessine atom to the nihonium atom, with the dipole moment value being −1.80 D. The spin–orbit interaction increases the dissociation energy of the TsF molecule because it lowers the electronegativity of tennessine, causing the bond with the extremely electronegative fluorine atom to have a more ionic character. Tennessine monofluoride should feature the strongest bonding of all group 17 monofluorides. ^ a b The declaration by the IUPAC mentioned "the contribution of the Tennessee region (emphasis added), including Oak Ridge National Laboratory, Vanderbilt University, and the University of Tennessee at Knoxville, to superheavy element research, including the production and chemical separation of unique actinide target materials for superheavy element synthesis at ORNL’s High Flux Isotope Reactor (HFIR) and Radiochemical Engineering Development Center (REDC)". ^ The term "group 17" refers to a column in the periodic table starting with fluorine and is distinct from "halogen", which relates to a common set of chemical and physical properties shared by fluorine, chlorine, bromine, iodine, and astatine, all of which precede tennessine in group 17. Unlike the other group 17 members, tennessine may not be a halogen. ^ Although stable isotopes of the lightest elements usually have a neutron–proton ratio close or equal to one (for example, the only stable isotope of aluminium has 13 protons and 14 neutrons, making a neutron–proton ratio of 1.077), stable isotopes of heavier elements have higher neutron–proton ratios, increasing with the number of protons. For example, iodine's only stable isotope has 53 protons and 74 neutrons, giving neutron–proton ratio of 1.396, gold's only stable isotope has 79 protons and 118 neutrons, yielding a neutron–proton ratio of 1.494, and plutonium's most stable isotope has 94 protons and 150 neutrons, and a neutron–proton ratio of 1.596. This trend is expected to make it difficult to synthesize the most stable isotopes of super-heavy elements as the neutron–proton ratios of the elements they are synthesized from will be too low. ^ A nuclide is commonly denoted by the chemical element's symbol immediately preceded by the mass number as a superscript and the atomic number as a subscript. Neutrons are represented as nuclides with atomic mass 1, atomic number 0, and symbol n. Outside the context of nuclear equations, the atomic number is sometimes omitted. An asterisk denotes an extremely short-lived (or even non-existent) intermediate stage of the reaction. ^ The letter n stands for the number of the period (horizontal row in the periodic table) the element belongs to. The letters "s" and "p" denote the s and p atomic orbitals, and the subsequent superscript numbers denote the numbers of electrons in each. Hence the notation ns2np5 means that the valence shells of lighter group 17 elements are composed of two s electrons and five p electrons, all located in the outermost electron energy level. ^ For comparison, the values for the ClF, HCl, SO, HF, and HI molecules are 0.89 D, 1.11 D, 1.55 D, 1.83 D, and 1.95 D. Values for molecules which do not form at standard conditions, namely GeSe, SnS, TlF, BaO, and NaCl, are 1.65 D, ~3.2 D, 4.23 D, 7.95 D, and 9.00 D.
^ Ritter, Malcolm (9 June 2016). "Periodic table elements named for Moscow, Japan, Tennessee". Associated Press. Retrieved 19 December 2017. ^ a b c Fricke, B. (1975). "Superheavy elements: a prediction of their chemical and physical properties". Recent Impact of Physics on Inorganic Chemistry. 21: 89–144. doi:10.1007/BFb0116498. Retrieved 4 October 2013. ^ Royal Society of Chemistry (2016). "Tennessine". rsc.org. Royal Society of Chemistry. Retrieved 9 November 2016. A highly radioactive metal, of which only a few atoms have ever been made. ^ a b c GSI (14 December 2015). "Research Program – Highlights". superheavies.de. GSI. Retrieved 9 November 2016. If this trend were followed, element 117 would likely be a rather volatile metal. Fully relativistic calculations agree with this expectation, however, they are in need of experimental confirmation. ^ a b c d e f g h i j k l m n o p q r Hoffman, Darleane C.; Lee, Diana M.; Pershina, Valeria (2006). "Transactinides and the future elements". In Morss; Edelstein, Norman M.; Fuger, Jean (eds.). The Chemistry of the Actinide and Transactinide Elements (3rd ed.). Dordrecht, The Netherlands: Springer Science+Business Media. ISBN 1-4020-3555-1. ^ a b c Chang, Zhiwei; Li, Jiguang; Dong, Chenzhong (2010). "Ionization Potentials, Electron Affinities, Resonance Excitation Energies, Oscillator Strengths, And Ionic Radii of Element Uus (Z = 117) and Astatine". J. Phys. Chem. A. 2010 (114): 13388–94. Bibcode:2010JPCA..11413388C. doi:10.1021/jp107411s. ^ a b c Khuyagbaatar, J.; Yakushev, A.; Düllmann, Ch. E.; et al. (2014). "48Ca+249Bk Fusion Reaction Leading to Element Z=117: Long-Lived α-Decaying 270Db and Discovery of 266Lr". Physical Review Letters. 112 (17): 172501. Bibcode:2014PhRvL.112q2501K. doi:10.1103/PhysRevLett.112.172501. PMID 24836239. ^ a b Oganessian, Yu. Ts. ; et al. (2013). "Experimental studies of the 249Bk + 48Ca reaction including decay properties and excitation function for isotopes of element 117, and discovery of the new isotope 277Mt". Physical Review C. 87 (5): 054621. Bibcode:2013PhRvC..87e4621O. doi:10.1103/PhysRevC.87.054621. ^ a b "Superheavy Element 117 Confirmed - On the Way to the "Island of Stability"". GSI Helmholtz Centre for Heavy Ion Research. Retrieved 2015-07-26. ^ a b Cabage, B. (2010). "International team discovers element 117". Oak Ridge National Laboratory. Archived from the original on 2015-09-23. Retrieved 2017-06-26. ^ a b "Vanderbilt physicist plays pivotal role in discovery of new super-heavy element". Vanderbilt University. 2010. Retrieved 2016-06-12. ^ Oganessian, Yu. Ts. ; Utyonkov, V. K.; Lobanov, Yu. V.; et al. (2002). "Results from the first 249Cf+48Ca experiment" (PDF). JINR Communication. Retrieved 2015-09-23. ^ a b c d e f Bardi, J. S. (2010). "An Atom at the End of the Material World". Inside Science. Retrieved 2015-01-03. ^ a b c Audi, G.; Bersillon, O.; Blachot, J.; et al. (2003). "The NUBASE evaluation of nuclear and decay properties" (PDF). Nuclear Physics A. 729 (1): 3–128. Bibcode:2003NuPhA.729....3A. CiteSeerX 10.1.1.692.8504. doi:10.1016/j.nuclphysa.2003.11.001. Archived from the original (PDF) on 2011-07-20. ^ Karpov, A. V.; Zagrebaev, V. I.; Palenzuela, Y. Martinez; Greiner, Walter (2013). "Superheavy Nuclei: Decay and Stability". Exciting Interdisciplinary Physics. FIAS Interdisciplinary Science Series. p. 69. doi:10.1007/978-3-319-00047-3_6. ISBN 978-3-319-00046-6. ^ a b c "What it takes to make a new element". Chemistry World. Retrieved 2016-12-03. ^ Witze, Alexandra (2010). "The backstory behind a new element". Science News. Retrieved 2016-06-12. ^ Emily Siner (2016). How Scientists Plan To Enshrine Tennessee On The Periodic Table Of Elements (Report). National Public Radio. Retrieved 2017-03-07. ^ a b c d e James Roberto (2010). The Discovery of Element 117 (PDF) (Report). Oak Ridge National Laboratory. Archived from the original (PDF) on 2016-10-21. Retrieved 2017-06-26. ^ a b c Joint Institute for Nuclear Research (2010). For the Press (Report). Retrieved 2015-07-28. ^ a b Stark, A. M. (2010). "International team discovers element 117". DOE/Lawrence Livermore National Laboratory. Retrieved 2012-11-29. ^ "Ununseptium – The 117th element". Sputnik. 2009-10-28. Retrieved 2012-07-07. ^ Greiner, W. (2010). "Recommendations: 31st meeting, PAC for nuclear physics" (PDF): 6. Archived from the original (PDF) on 2010-04-14. ^ U.S. DOE Office of Science (2011). "Nations Work Together to Discover New Element". U.S. Department of Energy. Retrieved 2016-01-05. ^ a b "Heaviest in the World". Arts and Science Magazine. Archived from the original on 2016-05-03. Retrieved 2016-06-12. ^ a b c d Oganessian, Yu. Ts. ; Abdullin, F. Sh. ; Bailey, P. D.; et al. (2010). "Synthesis of a New Element with Atomic Number Z=117". Physical Review Letters. 104 (142502): 142502. Bibcode:2010PhRvL.104n2502O. doi:10.1103/PhysRevLett.104.142502. PMID 20481935. ^ Molchanov, E. (2011). В лабораториях ОИЯИ. Возвращение к дубнию [In JINR labs. Returning to dubnium] (in Russian). JINR. Retrieved 2011-11-09. ^ Barber, R. C.; Karol, P. J.; Nakahara, H.; et al. (2011). "Discovery of the elements with atomic numbers greater than or equal to 113 (IUPAC Technical Report)". Pure and Applied Chemistry. 83 (7): 1485–1498. doi:10.1351/PAC-REP-10-05-01. ^ a b "Russian scientists confirm 117th element". Sputnik. 2012-06-25. Retrieved 2012-07-05. ^ Chow, D. (2014-05-01). "New Super-Heavy Element 117 Confirmed by Scientists". LiveScience. Retrieved 2014-05-02. ^ IUPAC (2015). "Discovery and Assignment of Elements with Atomic Numbers 113, 115, 117 and 118". Retrieved 2016-01-04. ^ Karol, Paul J.; Barber, Robert C.; Sherrill, Bradley M.; Vardaci, Emanuele; Yamazaki, Toshimitsu (22 December 2015). "Discovery of the elements with atomic numbers Z = 113, 115 and 117 (IUPAC Technical Report)" (PDF). Pure Appl. Chem. 88 (1–2): 139–153. doi:10.1515/pac-2015-0502. Retrieved 2 April 2016. ^ Zlokazov, V. B.; Utyonkov, V. K. (8 June 2017). "Analysis of decay chains of superheavy nuclei produced in the 249Bk+48Ca and 243Am+48Ca reactions". Journal of Physics G: Nuclear and Particle Physics. 44 (75107): 075107. Bibcode:2017JPhG...44g5107Z. doi:10.1088/1361-6471/aa7293. ^ Koppenol, Willem H; Corish, John; García-Martínez, Javier; Meija, Juris; Reedijk, Jan (2016). "How to name new chemical elements (IUPAC Recommendations 2016)". Pure and Applied Chemistry. 88 (4). doi:10.1515/pac-2015-0802. ^ Glanz, J. (2010). "Scientists Discover Heavy New Element". Oregon State University, Department of Chemistry. Retrieved 2016-01-05. ^ "IUPAC Is Naming The Four New Elements Nihonium, Moscovium, Tennessine, and Oganesson". IUPAC. 2016-06-08. Retrieved 2016-06-08. ^ "IUPAC Announces the Names of the Elements 113, 115, 117, and 118 - IUPAC | International Union of Pure and Applied Chemistry". IUPAC | International Union of Pure and Applied Chemistry. 2016-11-30. Retrieved 2016-11-30. ^ de Marcillac, P.; Coron, N.; Dambier, G.; et al. (2003). "Experimental detection of α-particles from the radioactive decay of natural bismuth". Nature. 422 (6934): 876–878. Bibcode:2003Natur.422..876D. doi:10.1038/nature01541. PMID 12712201. ^ Möller, P. (2016). "The limits of the nuclear chart set by fission and alpha decay" (PDF). EPJ Web of Conferences. 131: 03002:1–8. doi:10.1051/epjconf/201613103002. ^ Oganessian, Yu. Ts. ; Sobiczewski, A.; Ter-Akopian, G. M. (9 January 2017). "Superheavy nuclei: from predictions to discovery". Physica Scripta. 92 (2): 023003–1–21. Bibcode:2017PhyS...92b3003O. doi:10.1088/1402-4896/aa53c1. ^ a b "Element 117 is synthesized". JINR. 2010. Retrieved 2015-06-28. ^ Zagrebaev, V.; Karpov, A.; Greiner, W. (2013). Future of superheavy element research: Which nuclei could be synthesized within the next few years? (PDF). Journal of Physics: Conference Series. 420. pp. 1–15. arXiv:1207.5700. doi:10.1088/1742-6596/420/1/012001. Retrieved 2013-08-20. ^ Zhao-Qing, F.; Gen-Ming, Jin; Ming-Hui, Huang; et al. (2007). "Possible Way to Synthesize Superheavy Element Z = 117". Chinese Physics Letters. 24 (9): 2551. arXiv:0708.0159. Bibcode:2007ChPhL..24.2551F. doi:10.1088/0256-307X/24/9/024. ^ Zhao-Qing, F.; Jina, Gen-Ming; Li, Jun-Qing; et al. (2009). "Production of heavy and superheavy nuclei in massive fusion reactions". Nuclear Physics A. 816 (1–4): 33. arXiv:0803.1117. Bibcode:2009NuPhA.816...33F. doi:10.1016/j.nuclphysa.2008.11.003. ^ Chowdhury, R. P.; Samanta, C.; Basu, D. N. (2008). "Search for long lived heaviest nuclei beyond the valley of stability". Physical Review C. 77 (4): 044603. arXiv:0802.3837. Bibcode:2008PhRvC..77d4603C. doi:10.1103/PhysRevC.77.044603. ^ Duarte, S. B.; Tavares, O. A. P.; Gonçalves, M.; et al. (September 2004). Half-life prediction for decay modes for superheavy nuclei (PDF) (Report). Notas de Física. Centro Brasileiro de Pesquisas Físicas. Bibcode:2004JPhG...30.1487D. doi:10.1088/0954-3899/30/10/014. ISSN 0029-3865. ^ Utyonkov, V. K. (12 February 2008). "Синтез новых элементов 113-118 в реакциях полного слияния 48Ca + 238U-249Cf" [Synthesis of new elements 113–118 in complete fusion reactions 48Ca + 238U–249Cf] (PDF). nuclphys.sinp.msu.ru. Retrieved 28 April 2017. ^ Roberto, J. B. (31 March 2015). "Actinide Targets for Super-Heavy Element Research" (PDF). cyclotron.tamu.edu. Texas A & M University. Retrieved 28 April 2017. ^ Dhingra, A. (1999-12-01). The Sterling Dictionary Of Chemistry. Sterling Publishers Pvt. Ltd. p. 187. ISBN 978-81-7359-123-5. Retrieved 2015-07-23. ^ a b c d Fægri Jr., K.; Saue, T. (2001). "Diatomic molecules between very heavy elements of group 13 and group 17: A study of relativistic effects on bonding". The Journal of Chemical Physics. 115 (6): 2456. Bibcode:2001JChPh.115.2456F. doi:10.1063/1.1385366. ^ a b Thayer 2010, p. 64. ^ Pyykkö, P.; Atsumi, M. (2008-12-22). "Molecular Single-Bond Covalent Radii for Elements 1-118". Chemistry: A European Journal. 15: 186–197. doi:10.1002/chem.200800987. PMID 19058281. ^ a b Sharma, B. K. (2001). Nuclear and radiation chemistry (7th ed.). Krishna Prakashan Media. p. 147. ISBN 978-81-85842-63-9. Retrieved 2012-11-09. ^ a b Seaborg, Glenn T. (1994). Modern alchemy. World Scientific. p. 172. ISBN 978-981-02-1440-1. ^ Luig, H.; Keller, C.; Wolf, W.; et al. (2005). "Radionuclides". In Ullmann, F. (ed.). Encyclopedia of industrial chemistry. Wiley-VCH. p. 23. doi:10.1002/14356007.a22_499. ISBN 978-3-527-30673-2. ^ Wiberg, E.; Wiberg, N.; Holleman, A. F. (2001). Inorganic chemistry. Academic Press. p. 423. ISBN 978-0-12-352651-9. ^ Otozai, K.; Takahashi, N. (1982). "Estimation of the chemical form and the boiling point of elementary astatine by radiogas-chromatography". Radiochimica Acta. 31 (3‒4): 201‒203. ^ Bader, R. F. W. "An introduction to the electronic structure of atoms and molecules". McMaster University. Retrieved 2008-01-18. ^ a b Pershina 2010, p. 504. ^ a b c Bae, Ch. ; Han, Y.-K.; Lee, Yo. S. (2003-01-18). "Spin−Orbit and Relativistic Effects on Structures and Stabilities of Group 17 Fluorides EF3 (E = I, At, and Element 117): Relativity Induced Stability for the D3h Structure of (117)F3". The Journal of Physical Chemistry A. 107 (6): 852–858. Bibcode:2003JPCA..107..852B. doi:10.1021/jp026531m. ^ a b c d e Han, Y.-K.; Bae, Cheolbeom; Son, Sang-Kil; et al. (2000). "Spin-orbit effects on the transactinide p-block element monohydrides MH (M=element 113-118)". Journal of Chemical Physics. 112 (6): 2684–2691. Bibcode:2000JChPh.112.2684H. doi:10.1063/1.480842. ^ Stysziński 2010, pp. 144–146. ^ Lide, D. R. (2003). "Section 9, Molecular Structure and Spectroscopy". CRC Handbook of Chemistry and Physics (84th ed.). CRC Press. pp. 9–45, 9–46. ISBN 978-0-8493-0484-2. ^ Stysziński 2010, pp. 139–146. Thayer, J. S. (2010). "Relativistic Effects and the Chemistry of the Heavier Main Group Elements". Relativistic Methods for Chemists. p. 63. doi:10.1007/978-1-4020-9975-5_2. ISBN 978-1-4020-9974-8. Stysziński, J. (2010). "Why do we need relativistic computational methods?". Relativistic Methods for Chemists. pp. 99–164. doi:10.1007/978-1-4020-9975-5_3. ISBN 978-1-4020-9974-8. Pershina, V. (2010). "Electronic structure and chemistry of the heaviest elements". Relativistic Methods for Chemists. pp. 451–520. doi:10.1007/978-1-4020-9975-5_11. ISBN 978-1-4020-9974-8.